This is a guide for options available -- and recommended easy way -- for connecting your hosted domain (HostNed) email to your Gmail account. Your HostNed Web Hosting service already comes with email accounts. This includes standard connection protocols IMAP, POP3, and SMTP to use with various clients and applications (Outlook, Apple Mail, Thunderbird, K9 Mail, etc...). The web hosting also includes Webmail for checking your email through any web browser. You can also create email "Forwarders" that redirect mail to a different address. If you rather use Gmail as a "hub" for your various different email addresses, there are different ways to go about doing that, but the most common way I see is users setting up email "Forwarding" and have that address forward mail to your Gmail account. In your Gmail account you can receive that mail and you can also set up your Gmail account to "send mail as" your @jodywork.com account, that is in Gmail "Settings -> Accounts and Import -> Send Mail As". 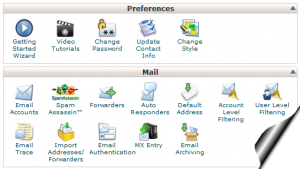 First you need to log in to your hosting Control Panel -- that is either Cpanel or Plesk. Even still, there are other ways to achieve this that are more complicated. Also there is the way by changing the MX records and Cnames and various DNS settings to do more direct email management through Gmail, most often combined with Paid Upgraded Google Apps for Business.